Where in the world did Secretary Clinton vacation? MR. KELLY: I think I can assure you she’s not going to New Mexico, no. QUESTION: What exactly was the itinerary that was approved? QUESTION: Ask the North Koreans? QUESTION: Thank you. Were there other stops – were there other stops? MR. KELLY: — proposed itinerary. MR. KELLY: There were other stops. QUESTION: — one of them be a place that North Koreans might not generally be comfortable with going to? QUESTION: A little bit north. Are they going to Vegas? QUESTION: Are they going to Las Vegas? MR. KELLY: You’ll have to ask the North Korean mission, Matt, if they’re going to Las Vegas. QUESTION: What about Los Angeles? MR. KELLY: I believe you’ll have to ask the North Korean mission, Matt. I don’t know if the North Koreans were able to track Bermuda on their map. 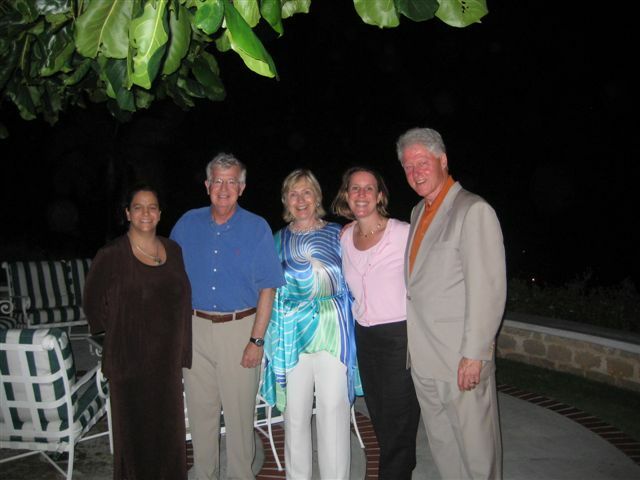 Above photo showed the Secretary of State and President Clinton with some US ConGen Bermuda’s staff a few days ago. The Clintons were with (right-left) Consul General Grace Shelton, Deputy Principal Officer Frank Fulgham and Consul Margaret Pride in Hamilton. $75 million to run a single PRT is not excessive? The State Department’s Office of the Inspector General (OIG) has just released two Iraq-related reports the last few days. One on the Embassy’s transition planning as the Department take on increased roles and responsibilities following the withdrawal of all US forces from Iraq by December 31, 2011 (we’ll get to that in a separate post); the other report is a review of the effectiveness of Regional Embassy Offices (REOs) in Iraq. 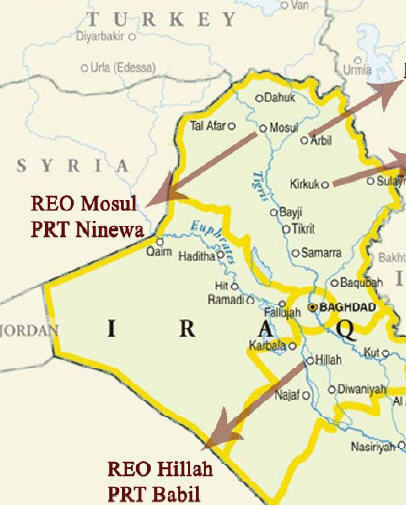 REO Hillah was established in June 2004 on the site of the former regional headquarters of the Coalition Provisional Authority for south central Iraq. The south central area is known as the Shia heartland, with the city of An Najaf serving as the capital. Babil Province, south of Baghdad, has a mixed Sunni and Shia population, and is an important transport and fuel network, which creates sectarian volatility. REO Hillah mainly served as a base for five PRTs operating in Babil, Karbala, Najaf, Wasit, and Qadisiyah. However, by early 2008, four of the PRTs in Hillah were trans­ferred to their respective provinces, and REO Hillah supported only PRT Babil. OIG visited REO Hillah in February 2009, and an interim report was issued in April 2009 recommending: (1) stopping or curtailing all capital improvement proj­ects; (2) relocating PRT Babil and other USG employees to a nearby U.S. Army base; (3) curtailing or transferring REO Hillah security and support staff to other locations in Iraq; and (4) decommissioning and returning the Hillah hotel property to the Government of Iraq. Embassy Baghdad objected to OIG’s recommendation to accelerate the closing of REO Hillah stating that speeding closure and relocation would undermine an existing process moving forward at a measured pace. The Embassy emphasized the need to consider the negative impact on all of the organizations and personnel supported by the REO. Embassy Baghdad had calculated $55 million in annual security costs at REO Hillah to support approximately 300 personal security specialists and a perimeter guard force. The annual support costs for about 350 KBR employees and locally hired Iraqis was estimated at $20 million. REO Hillah is currently supporting one 37-member PRT, and OIG determined that $75 million in annual operating costs was excessive and an expensive way to support a single PRT. OIG observed that cost savings of $6.5 million a month meant that closure of the REO by May 2009 could result in savings of more than $32 million in FY 2009. In addition to the operating costs, REO Hillah had 10 capital improvement projects underway, including three not yet begun and valued at $1.4 million, four projects that were 15 percent completed leaving $235,000 unobligated, and three projects 25 to 73 percent completed with $643,000 unobligated, adding up to potentially nearly $2.3 million in unexpended funds. OIG has learned that the Embassy has stopped all capital improvement projects at REO Hillah. The Embassy’s contracting officer’s representative, with management support, rejected requests by the site contractor to continue with several proposals, including work on a firing range, procurement of communications systems for fire trucks, and purchase of handheld radios. However, as of July 2, 2009, Embassy Baghdad had not taken any further action toward closing REO Hillah. Therefore, OIG reiterates its recommendation to accelerate the relocation of PRT Babil and the closure of REO Hillah. The Embassy is understandably concerned about the “negative impact on all of the organizations and personnel supported by the REO.” But please let’s think about this for a moment. If REO Hillah is supporting a 37-member PRT, that’s over $2 million dollars to support each PRT member in that location. The move would be inconvenient for sure, but how much of a negative impact is there going to be if the PRT operation moves to the nearby U.S. Army base as suggested by the OIG? I would have felt much better if Embassy Baghdad quantified that in their response to the report; otherwise, I can’t help but agree that $75 million is just a tad much as operation cost for a 37-member PRT. On a related note — AFP recently reported that in May this year, the administration projected a 3.998 trillion dollar budget for 2009 with a deficit of 1.841 trillion dollars, reflecting swollen spending amid the worst economic crisis on record. The estimated budget deficit for the current fiscal 2009 ending September 30 will reportedly be trimmed to 1.58 trillion dollars, around 262 billion dollars lower than forecasted. Yay?! When it comes to distinguishing between the Foreign Service career paths, many officers still give me a blank stare when I mention I’m a specialist and not a generalist. I get the impression that once someone is in a-100 class (generalist’s orientation) they never hear about the specialist path. […] I understand American’s coming from other agencies serving a tour as an FSO not picking up on it. Everything in the department of state is new to them. I’m talking about regular FSOs that have already worked for several tours. I explain to them the differences in pay, job responsibilities, usually no language training, etc. Invariably, I get asked by post to fill in for officers even though I’ve never received any generalist training in that regard. I’ve been a backup for management officers but that usually the norm for an IT person, since we work under that section and learn about it anyway. But my current post has brought up other back-fill positions that I really have no right to do at the expense of my own responsibilities. I’m all about working as a team, but that’s like putting a running back into a wide receiver position. You better plan on seeing a few balls get dropped. A good thing that Judge Paul Friedman of the US District Court of the District of Columbia dismissed this case. One plaintiff, proceeding in forma pauperis, filed a pro se complaint seeking to compel the issuance of a visa for his fiancée and requesting one million dollars in damages for the allegedly wrongful initial denial of the visa, and for “unreasonable harassment” and denial of civil rights in the process. Compl. at 2. The Court appointed pro bono counsel for the plaintiff and stayed the case to allow the parties time to resolve the matter. The plaintiff’s fiancé has since been issued a visa, and the plaintiff has voluntarily dismissed the U.S. Citizen and Immigration Service as a defendant. See Joint Status Report, July 30, 2009, ¶¶ 2, 4; Order, Aug. 11, 2009 (dismissing the U.S. Citizen and Immigration Service as a defendant). 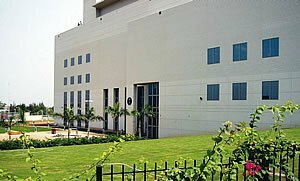 The plaintiff, however, asks the Court to admonish or sanction the remaining defendant, the U.S. Consul General in Mumbai, India, for its conduct in what plaintiff alleges was delay in the process of obtaining the visa. See Joint Status Report ¶ 5(a). The defendant contends that this Court has no jurisdiction over this matter, there was no wrong-doing by the defendant, the case has become moot with the issuance of a visa for the plaintiff’s fiancée and that therefore, the sole remaining party should be dismissed. See id. ¶ 5(b). The plaintiff has not identified either a cause of action upon which may be based a claim for sanctions, admonition, or damages against the U.S. Consul General for Mumbai, or a basis for this Court’s jurisdiction over such an action. The Court is aware of no such jurisdiction or cause of action. Accordingly, the complaint will be dismissed for lack of subject matter jurisdiction. But that’s not all. Included in the papers is the Court’s expression of appreciation to Karen Grisez, Esq., and to the firm of Fried, Frank, Harris, Shriver & Jacobson, for its able pro bono publico representation of the plaintiff, who was proceeding in forma pauperis. In forma pauperis . Someone who is without the funds to pursue the normal costs of a lawsuit or criminal defense. I know what you’re thinking. How did Romeo get around the I-134 requirement? I mean, if you can’t afford the normal cost of a lawsuit, how can you afford to live with your US-bound fiancée in America? The Affidavit of Support need to show that the sponsor’s income is 100 percent of federal poverty guidelines as required under Section 212(a)(4) of the INA. Um, okay, I get it — somebody else signed the I-134? But if the fiancee becomes a public charge later, would USCIS then turn around and deport her back to her … hmmn? no? Long conflict can wreck a country, leaving behind poverty and chaos. But what’s the right way to help war-torn countries rebuild? At TED@State, Paul Collier explains the problems with current post-conflict aid plans, and suggests 3 ideas for a better approach. Paul Collier studies the political and economic problems of the very poorest countries: 50 societies, many in sub-Saharan Africa, that are stagnating or in decline, and taking a billion people down with them. His book The Bottom Billion identifies the four traps that keep such countries mired in poverty, and outlines ways to help them escape, with a mix of direct aid and external support for internal change. From 1998 to 2003, Collier was the director of the World Bank’s Development Research Group; he now directs the Centre for the Study of African Economies at Oxford, where he continues to advise policymakers. I have put together a compilation of lessons learned resources with some relevance to the State Department and the Foreign Service here. The web page is live in googlepages and will be updated as needed; a new link is added from Diplopundit’s Online Resources for easy access (see right side-bar). Any suggestion for additional materials would be deeply appreciated. I also found this Mike Licht image of a lessons learned tombstone. He writes in his blog that “A “Lessons Learned” report is a ceremonial corporate mea culpa that will be swiftly embalmed, buried, entombed in archives, and unread by the next set of leaders, who will embark on similar misguided projects of their own.” I hope that is not the case here. Sudan’s North-South Comprehensive Peace Agreement (CPA) is a unique example of an effort by the international community to negotiate and to implement a peace agreement. The Sudan Experience Project Oral History Library contains the transcripts of nearly 100 interviews with those who negotiated and who are implementing the CPA. These first person accounts and the lessons learned from their experience are a substantial contribution to our understanding of the challenges of negotiating and implementing complex peace agreements. This report is the product of the United States Institute of Peace’s Afghanistan Experience Project. It is based on extensive interviews conducted with American and foreign officials, soldiers, and representatives of nongovernmental organizations that worked directly with Provincial Reconstruction Teams in Afghanistan. It also reflects interviews conducted with a broad range of contacts during the author’s visit to Afghanistan in June 2005. The report discusses lessons identified by those who served in Afghanistan. It is intended as a training aid for developing programs that prepare American personnel for service in peace and stability operations. Robert M. Perito, Coordinator of the Afghanistan Experience Project at the U.S. Institute of Peace, prepared this report. and his CO’s legs. He doesn’t talk about it much. for two or three months first. Iraq might even look good. as he fought the middle-aged battle of the bulge. first wife told me before she left. in the same country at the very same time. and when I try, it sounds like just one more lie. A frequent contributor to WLA, Joseph T. Cox is headmaster of the Haverford School and author of the poetry collection Garden’s Close. The book is an engrossing read; frankly, reading Chuck Yeager flying the NF-104 is more exciting than watching any teenage-driven demographic movies that populate the cinema these days. The book is also about the wives and the unwritten rules and standards they lived by as they supported their husbands’ careers. This was out of the 40’s and 50’s, where wives generally stayed home, and where trailing husbands as a specie, were still unheard of except in the celestial wormholes of Jupiter. A commander designated to give the wives an orientation lecture says: “First, would you ladies please rearrange yourselves by rank, with the highest ranking wives sitting in the first row and so on the back to the rear: It takes about fifteen minutes for the women to sort themselves out and change their seats, since very few of them know one another. Once the process has been completed, the commander fixes a stern glare upon them and says: “Ladies, I want you to know that I have just witnessed the most ridiculous performance I have ever seen in my entire military career. Allow me to inform you that no matter who your husbands are, you have no rank whatsoever. You are all equals, and you should kindly remember to conduct yourselves as such in all dealings with one another.” That was not the end of the story, however. The wives stared back at their instructor with looks of utter bemusement and, as if with a single mind, said to themselves: “Who is this idiot and what planet has he been stationed on?” For the inexpressible provisions of the Military Wife’s Compact were well known to all. A military officer’s wife rose in rank with her husband and immediately took on all the honors and perquisites pertaining thereto, and only a fool or the sort of simple-minded jerk who was assigned to give orientation lectures to wives could fail to comprehend this. They will know the truth soon enough. Despite a robust package of incentives, staffing Lagos and Abuja was hard, with many officers in stretch assignments, working out-of-cone, on excursion tours, or on directed first assignments. These staffing woes, an operating budget that was lagging behind program funding, and aging facilities in Lagos reduced the efficiency of diplomatic operations. Both the consulate office building and many U.S. Government-owned residences in Lagos had suffered physical neglect, based partly on the view that operations in Lagos would get smaller when the Embassy moved to Abuja in 2000. This shrinkage is unlikely to happen. (A UW-Madison sophomore recounts her experience being detained and deported from her host country of Ethiopia).